Nov 21, 2011 – Two weeks after he is found guilty of involuntary manslaughter in Michael Jackson’s death, Conrad Murray attorney Michael Flanagan asked Superior Court Judge Michael Pastor to allow for People’s 30 to be tested for Lidocaine residue. The proposed scenario Michael Flanagan wants to confirm or negate is Dr. Steven Shafer's theory that Murray removed some Propofol from the 100ml propofol vial, added some Lidocaine then infused the vial into Michael Jackson. Michael Flanagan contends that if Dr. Steven Shafer's theory is correct then the residue in the vial should contain Lidocaine. Flanagan stated that it didn't occur to him to test the contents of the vial because Dr. Shafer testified that he believed Murray injected Lidocaine into the Propofol vial when he was recalled at the very end of the trial. Propofol causes burning at the injection site. To alleviate the burning, Conrad Murray used Lidocaine. Lidocaine comes in cream form and the injectable liquid form. Conrad Murray bought both kinds. So perhaps, that morning he used Lidocaine cream. Or perhaps he injected Lidocaine via the y-port of the concoction he set up. This is substantiated by the presence of Lidocaine in the short tubing of the IV set-up. Who knows how Conrad Murray gave Lidocaine that morning. What we do know is that this subject is not, AT ALL, important in the grand scheme of things. [Dr. Shafer’s] theory” stated Conrad Murray attorney Valeria Wass. 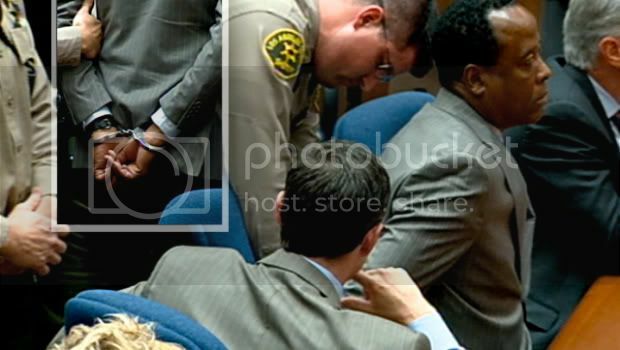 Aug 13, 2012 – Appellate Court denied Conrad Murray’s request. Oct 2, 2012 – Conrad Murray takes his case to the Supreme Court. 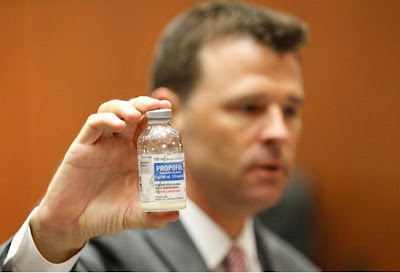 The testing of propofol vial is Conrad Murray grasping at straws. EVEN IF Michael Jackson did cause his demise, Conrad Murray would still have been guilty. 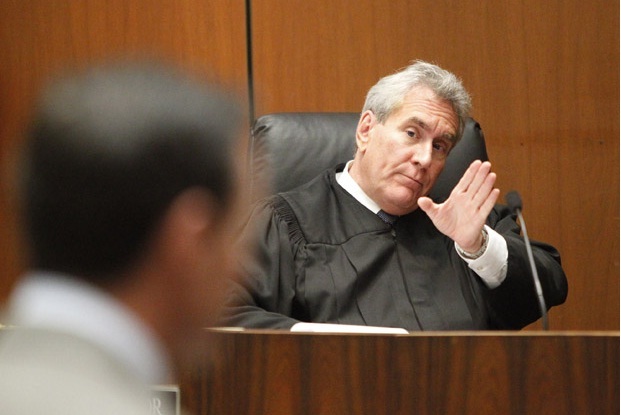 Prosecution witness Dr Steven Shafer was left to postulate various theories because Conrad Murray didn’t maintain any records of his “insomnia treatment with Propofol.” The prosecution doesn’t have to exactly pinpoint how Conrad Murray killed Michael Jackson. 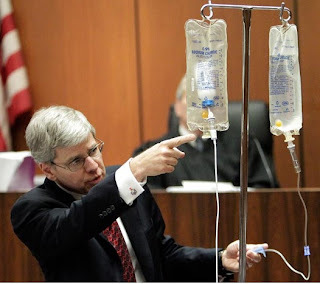 The jury didn’t convict Conrad Murray because there may or may not be a propofol infusion. They convicted him for being “a substantial factor” in Michael Jackson’s death. In my opinion, Conrad Murray request will be denied by the Supreme Court also. Because the testing is totally irrelevant to the guilty verdict. Murray really should have been charged with Murder One instead of involuntary manslaughter. Murray's training and experience make it well nigh impossible that Jackson's death was accidental or that Murray's actions and treatment were the result of mere negligence. When I wrote the Michael Jackson chapter in 'Getting Over Going Under,' I assumed Murray was just a fool operating out of his knowledge base who made a tragic mistake in the greedy pursuit of money. I was the board certified anesthesiologist Murray's defense attorney, Michael Flanagan, sought out before they got Paul White. "When Dr. Murray performs cardioversion, he doesn't even start an IV. He just injects the propofol directly into the patient's vein." My eyes grew very large in astonishment. I responded saying, "Well you have impressed me, but not in the manner in which you hoped. There are no words to adequately describe the recklessness of Murray's conduct." Later, during Murray's trial, I learned Murray had hospital clinical privileges to perform cardiac catheterization under propofol sedation necessitating pulse oximeter monitoring. Murray knew perfectly well what the significance of a decreasing pulse oximeter tone meant; i.e. inadequate breathing. Despite his pulse oximeter knowledge, Murray purchased the cheapest pulse oximeter on the market - one that had neither an audible tone nor an alarm. By his own public admission, he gave Jackson propofol & left the room - an act commonly described as patient abandonment. It was only then I understood that Murray, while maybe an intelligent person, does not believe the well-established safety guidelines apply to his practice. This type of reckless behavior is common among sociopaths who under no circumstances should ever hold a license to practice medicine.